Christmas is approaching quickly. And for many people, Christmas is the time for long holidays in exotic locations all over the globe. 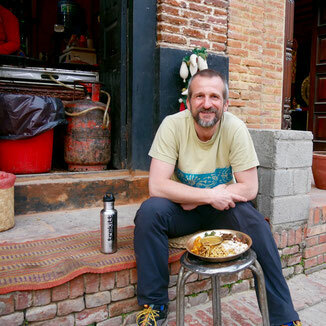 Amputees and other people with limb differences are often as keen to travel and explore off-the-beaten track places, meet new people and experience exciting cultures as people without a disability. At the same time, many of us are much worried about the potential challenges we might face. This often means that people with disabilities shy away from visiting the places they dream of. Fortunately there has been a lot of awareness work focussing on accessible tourism in recent years. On the one hand more and more locations improve their infrastructure and expand their services to make it easier and more enjoyable for people with disabilities. 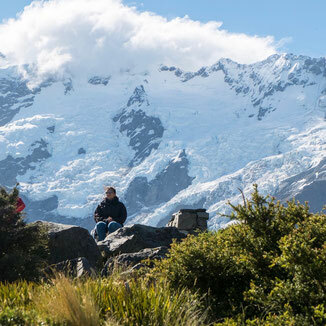 On the other hand there is an increasing number of very experienced tour-operators providing all the hands-on assistance and the local knowledge that is needed to enable people with disabilities to have the time of their life. For today’s article I teamed up with Access2Africa Safaris from South Africa to present one such company and their incredible work. In 2001 J.J. Bezuidenhout dived into a swimming pool which left him a quadriplegic. Since then he is in a powerchair. J.J. is a mouth painter and wildlife artist. He has joined Mouth and Foot Artist Association which is an organization operating worldwide. He is the inspiration behind Access2Africa Safaris, a company he founded together with his wife Jennae. Access2Africa Safaris is based in Kwazulu Natal’s Hluhluwe just 10km from South Africa`s 2nd largest National Park – Hluhluwe/Umfolozi Game Reserve. Since 2007 they are offering wheelchair friendly and accessible tours, safaris and travel for the disabled, handicapped and mobility impaired including hearing impaired and visually impaired guests. The company can look back an an impressive track record. 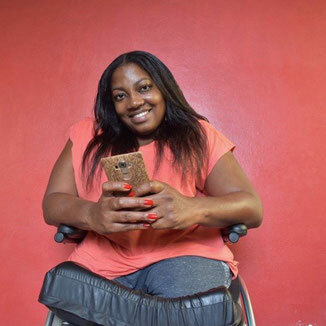 Their immense expertise combined with their creative approach to provide highly personal travel experiences for people with disabilities earned them several awards, among them the highly prestigious South African Tourism Lilizela Award in several categories as well as other national awards in recent years. „It has been an incredible journey with what we do and the greatest reward is to see the joy on our guests faces doing activities they thought previously they could never experience,“ says Jennae. On the Spinal Life Peer Support website I came across some photos from a lady, Alma, about her trip to South Africa. 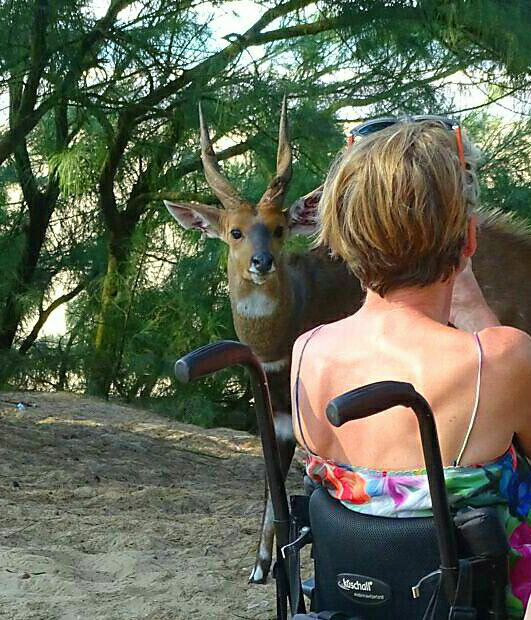 She had enjoyed an accessible wheelchair friendly Safari with Access2Africa Safaris. I was very impressed. That was two years ago and I thought if Alma can do it so can I. I booked my trip and then sorted out the details. 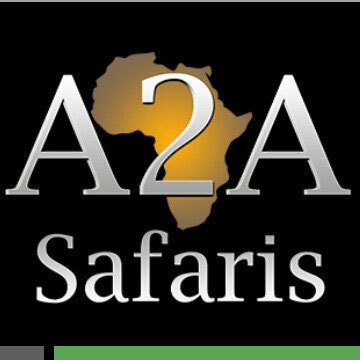 Access2Africa Safaris is a well organized operator who specializes in accessible safaris in South Africa for guests with mobility, vision or hearing challenges. All are welcome including friends and families. I can honestly say it was the best and the most organized holiday I have ever been on. I was collected at the airport at the beginning and then returned when it is time to depart. Their staff were lovely and we were all very well cared for. Their fleet of accessible wheelchair friendly vehicles was great, all air conditioned, and equipped with ramps. There was plenty of room for us all. If I preferred, one of the guides would pick me up and whisk me into the front seat. Wow. One young lady who is a wheelchair user wanted to put her feet in the Indian Ocean at a special viewpoint at the Isimangaliso Wetland Park. Her guide lifted her up and carried her down to the water’s edge. She was so excited and thrilled! Wheeled people seldom get to enjoy such pleasures as we tend to become bogged! We started off at a magnificent Lodge in Durban where we stayed three nights, we had the run of 30 acres of beautiful landscaped grounds where we could unwind and get over our jetlag. There were 21 of us, five in wheelchairs. I found my new friends delightful to be with and enjoyed talking with people who did not judge me because I was sitting down! We had an outing before we left Durban. There is a wonderful aquarium made from an old ship and we could see fish, sharks, etc. from all sides of the vessel. You could even go swimming with the sharks. A huge bonus at this Durban Beachfront was the lovely accessible beach mat and beach wheelchairs that go up to the sea and water. There was a bit of shopping time so some of us managed a bargain or two. The next day we headed to the Hluhluwe/Umfolozi Game Park and Nature Reserve. This is South Africa’s second largest Big Five Game Reserve and it’s based in the Isimangalsio Wetland Park in South Africa’s Kwazulu Natal province. Upon arrival I was blown away by plenty of wildlife sightings and photography was excellent. Our accessible lodge was on a high hill with the chalets spread along the top. These had beautiful expansive views down in to the valley. We all spent many hours exploring the game park. One early morning we were in the open park vehicle and quietly parked near a herd of elephants. Our field guide said they were there, although we could not see any of them. But soon there was the sound of breaking branches and movement. Eventually one female elephant slowly emerged from the undergrowth and wandered off, soon to be followed by several others, one at a time and quietly. It was lovely there in the shade, the sounds of unfamiliar birds, and the scent of unknown plants, combined with the gentle stillness, it belied the animals concealed in this magnificent reserve. Slowly the matriarch emerged, she was twice the size of the previous elephants. She gave us a long look, decided we were not dangerous (thank goodness) and wandered off with her herd. When I returned to my thatched villa that day (with a wheelchair friendly bathroom!) there were five Nyala grazing on my entry way and when I ventured inside I could see there were two buffalos snoozing on the hill opposite, being carefully groomed by little birds. Bliss! We all went for an early morning accessible open safari game drive on the big open air trucks and although the temperature was cooler we were all very excited. We saw more herds of elephant, rhinos, buffalos and buck of all descriptions. What more could we want! We also had a fantastic adventure meeting and feeding wild elephants. What a magnificent experience. There were three wild elephants, the biggest one a tusked bull. I stroked his trunk, his tusks, his tongue. He was beautiful, and all the time we scooped pellets into his trunk. If you were not paying enough attention to the trunk he flicked a little mud in your direction. As I felt his rough skin I wondered if moisturizer would be helpful. It was a magical day and one I will never forget. One of our activities was a visit to a Cheetah and Wild African Cat Reserve, along with caracals and servals. We could get up close and personal with the cheetahs! I was the centre of attention for one of the cheetahs, thankfully not in the paddock we were aiming for, she followed me everywhere and stared in my eyes. I learned later that the cheetahs are fed from a red trolley, and as my scooter was red I was the original meals on wheels. There were some bigger cats called caracals, with black ears and a beautiful light tan and cream color. The male of the group sat wonderfully relaxed with his front paws crossed. The servals were next and were spotted quite like cheetahs, but much smaller. The pair in one enclosure contained a female who lived in a large tree. Her coloring blended almost perfectly with the tree and I took a little while to find her. She was fed there too. The male had a problem with climbing trees; he had fallen out three times so he enjoyed the whole enclosure. The female was safe and happy in the tree. Our final stop with three nights stay was St. Lucia, a beautiful little town on the coast. We enjoyed a safari boat ride with close sightings of hippos, crocodiles and birds such as Fish Eagles. Getting the reclining wheelchair onto the boat was no mean feat (accessibility with ramps is dependent on water levels). But nobody missed out on anything and everyone boarded the boat. We were delighted and enthralled by the hippos and enjoyed seeing the other wildlife. The Lake is not very deep so the baby hippos stand on their mothers’ backs until they are big enough to stand in the lake alone. The weaver birds amazed me with their intricately woven nests and their bright colors. What further delighted me was one evening we watched the hippos grazing in the park opposite our accommodation. Dave our guide moved his van and shone his headlights on them. They were not concerned at all. There are even a signs on entering some roads in St. Lucia to alert visitors to their nocturnal habits. I did not want to come home; I had such a good time with new friends, great accommodation, wonderful food, fabulous service and assistance. Each room had its own accessible bathroom, and a balcony. Spending time in the same place for a few days each time made it much more relaxing and enjoyable.